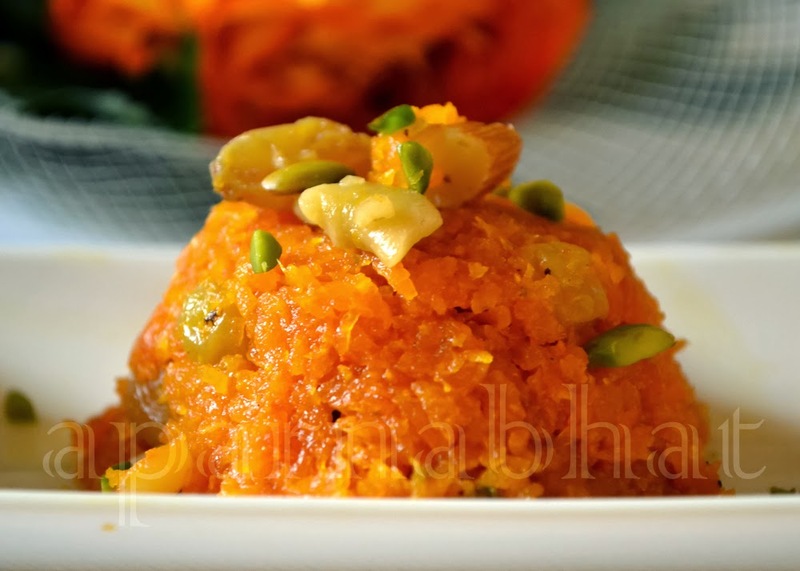 Carrot halwa, a North Indian sweet made with carrots, milk [preferably full cream milk], sugar, ghee and nuts has become popular in weddings and festivals all over India. A recipe with simple steps except for the part of grating carrots. But then I don't mind breaking my back and hands to do that strenuous step because once it is ready I just can't limit myself to one bowl. There are different ways that you can enjoy this sweet, cold or warm. 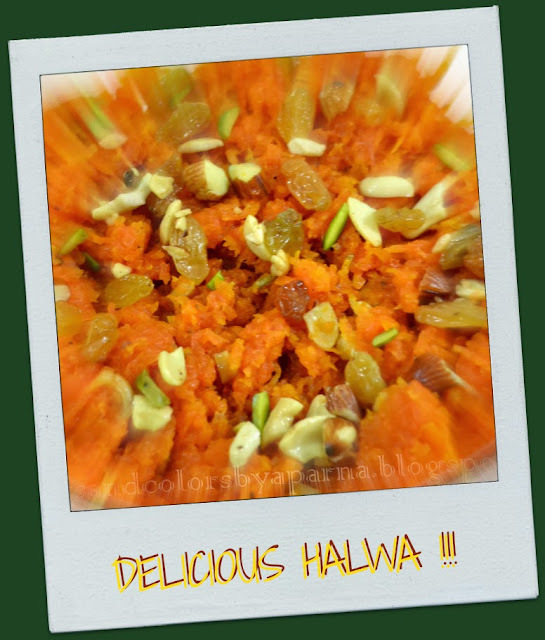 A new trend that has been introduced is to serve this hot halwa paired with a scoop of ice-cream and it tastes delicious!!! Wash, peel and grate carrots. Heat 1 tbsp of ghee in a pan and roast the dryfruits [have used cashews, raisins, almonds and pistas]. Keep them aside to garnish. Heat the remaining ghee in the same pan. Add grated carrots and sauté it for 4-5 minutes or till carrots become soft and changes its color. Add the milk and cook till it evaporates. Now add condensed milk and stir the mixture. Add sugar as per your preference of sweetness [Keep in mind that you have added condensed milk], cardamom powder and stir fry on medium flame for 5 minutes. Stir it continuously so that the mixture doesn't get burnt at the base of the pan. Switch off the flame once the halwa starts to leave the sides of the pan and garnish it with roasted nuts. Serve it warm or chilled. Popularly known as "Gajar ka Halwa", I am sure it reminds you of a famous dialogue/scene from bollywood movies where a mom tells her son " Beta maine tere liye gajar ka halwa banaya hai !". 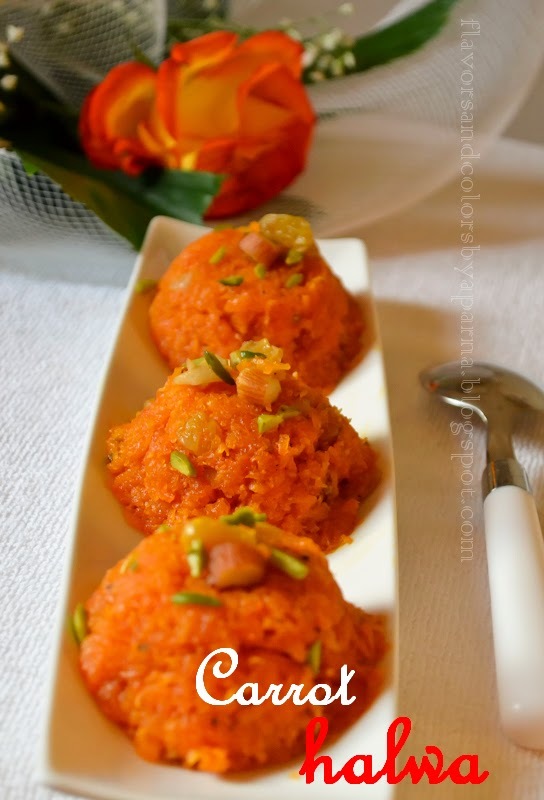 Don't know what's the connection between gajar ka halwa and reel mom son duo in each and every movie ...lol ... whatever it is, bollywood surely has made this sweet popular and been appreciated worldwide. Catch you in next post !